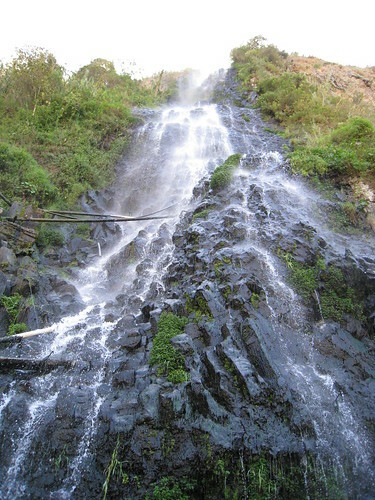 Waterfall in Banos, originally uploaded by burro come churro. This is the waterfall on the far side of Baños that comes right off the side of the mountain, through a few pools and then straight through a clothes washing area that looks like it´s a few hundred years old where people (read women) are busy scraping clothes clean on the stones. We went to a hot springs here which was interesting. Very interesting. ¨Rustic¨ is the word I´d use. Maybe there are more rustic natural pools around the world but this pool we went to had many people crammed in together as it was the only really hot one so it was kinda like taking a bath with a whole gang of Strangers. Hot water percolated up through the cement on the floor and the perforations where the water was coming through were boiling hot so you had to watch your step. The co-ed pre and post dip shower was pretty interesting if not altogether sanitary feeling. I´m not sure if Hayley would call bug-eyed stares interesting though. It was refreshing though and the water was so cloudy with minerals that I´m sure we got some rejuvination from them.